To determine your size using the Pin-up Girls bra patterns, you need only two measurements. It doesn’t matter if you use inches or centimeters, just as long as you use the same for both measurements. Measure the high bust, pulling the tape snug against the skin but not tight. The high bust measurement determines your band size. The chart below should help determine your band size. Now measure over the fullest part of the bust, but do not pull the tape snug, just tight enough to keep it from sliding down. This is the full bust measurement. Sewing your own bra is fun, it doesn’t take a lot of time and best of all, it can fit you better than ready-to-wear! 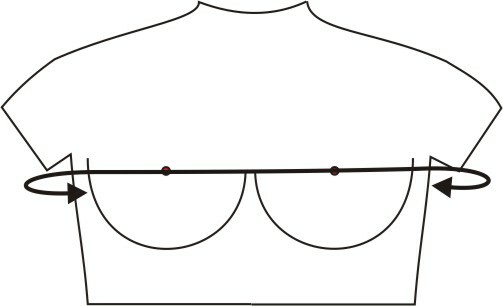 But before you can start on the journey to your happy place, we need to learn how to determine your bra pattern size. To determine your bra pattern size, you need to measure with your best-fitting bra on, but not a foam cup bra, as this will not be accurate. If you don’t have a bra that fits, the measurement will not be totally accurate since the breast tissue will be compressed. Hold the tape measure level and not twisted. 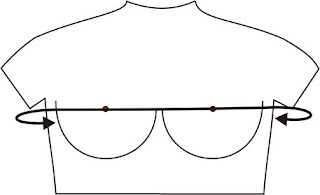 Determine your bra pattern size by putting the band size and the cup size together. So if my band size is 36 and my cup size is D, then my bra pattern size would be 36D. If the chart size is greatly different from your ready-to-wear bra size, and that size fits you, make a trial bra in your ready-to-wear size and assess the fit. Getting the right fit in the cups is the most important thing. If the cups fit but the band doesn’t, the band is easy to adjust. If the cups fit, but the band is too short: lengthen the band. You do not need to make a new cup. It is much easier to lengthen the band. If the cups fit, but the band is too long: shorten the band. You do not need to make a new cup. It is much easier to shorten the band. You can download an easy to print version of this blog post in document form here.